In spite of living for a long time in NCR I have hardly explored Old Delhi. So when I saw an invitation from Delhipedia for a food walk in Chandni Chowk I accepted it without hesitation. It was an afternoon walk. I was so excited about it that I didn’t even consider the weather. But the weather cooperated with us. The day was not so hot. 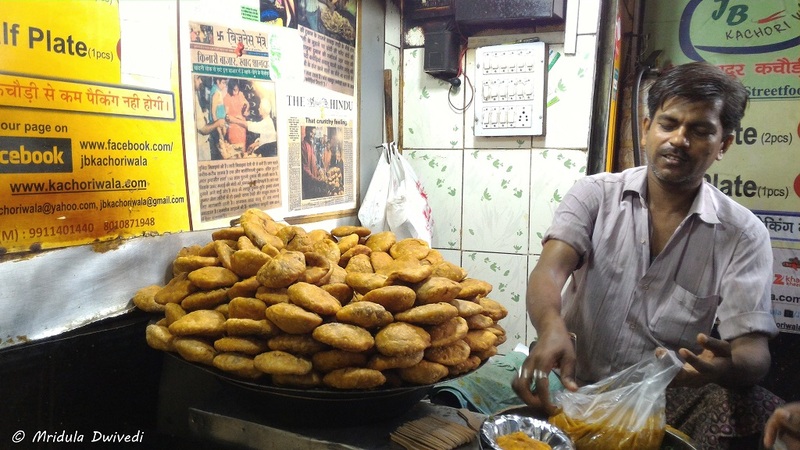 So without any further delay let me take you on the food trail in Old Delhi that I did. 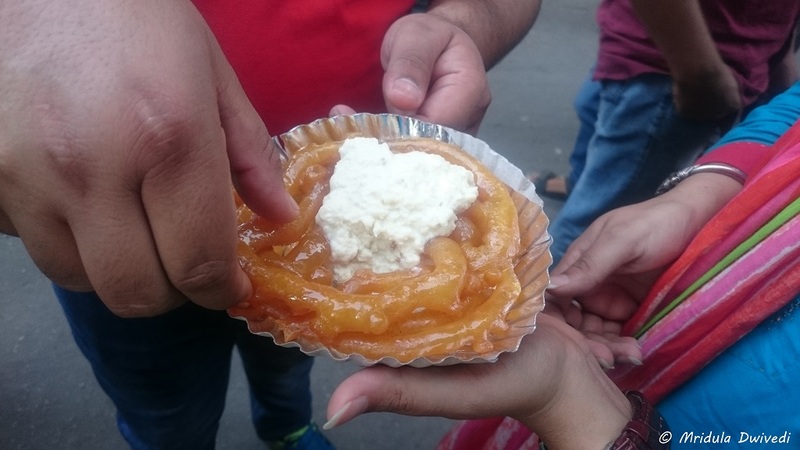 We had 5 food stops- Natraj Dhai Bhalla Corner, Amritsai Lassi Wala, Gole Hatti, JB Kachori Wala and Old Famous Jalebi Wala. 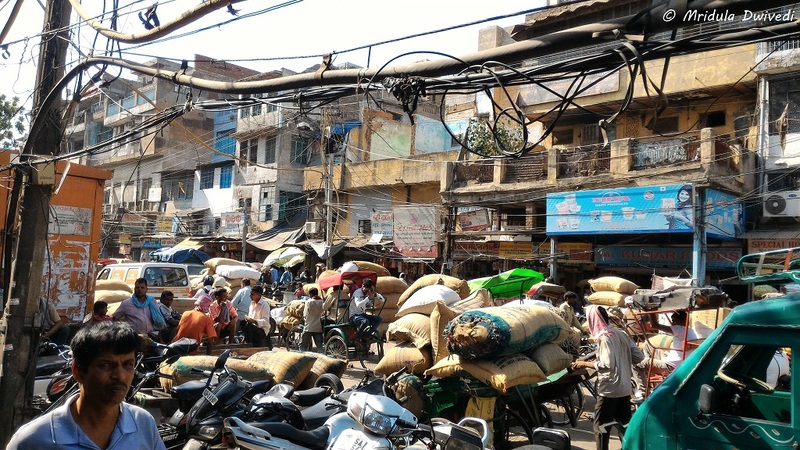 We also stopped at the famous spice market in the Khari Baoli area, considered to be the Asia’s largest spice market. You can see it all in the video by the Delhipedia team. Our first stop was Natraj Dhai Bhalla Corner. As soon as we climbed up the stairs, the place felt familiar to me. I actually went to Old Delhi once with Chhavi and just to escape the crowd we climbed up the stairs of this shop and had food there. I didn’t know then that it was a famous shop. We had Dhai Bhalla and Aloo Tikki at this place. I liked the Dhai Bhalla a lot. It was lip smacking good, the dhai (curd) was quite creamy and the overall taste wonderful. 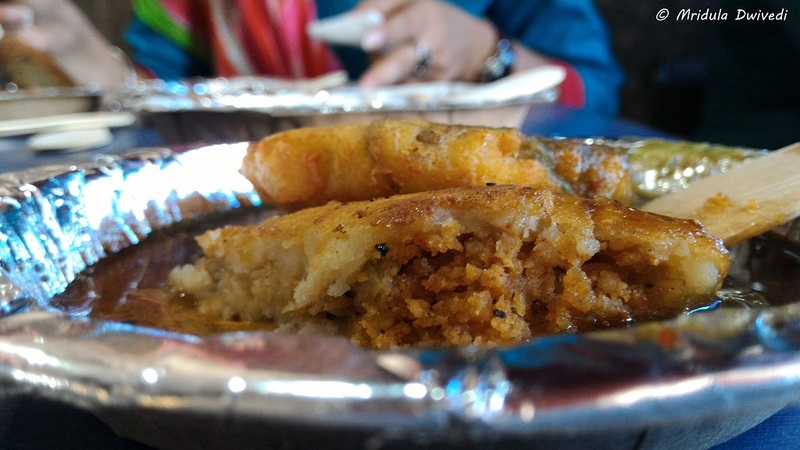 The Aloo Tikki was good too but the inner filling was too spicy for me. In the end I had to leave a small portion of the inner filling in the plate. I felt guilty but I could not finish it. This shop is quite close to the Chandni Chowk Metro Station. After having the chaat most of us protested that ordering one plate for each person was just too much. At other stops we would share food. That was a good idea except at Amritsari Lassi Wala. I had a Mango Lassi and I had it all to myself. It was full of malai and I enjoyed eating it the most. The Lassi was delicious too. When I go back to Chandni Chowk again, I am going there for sure. 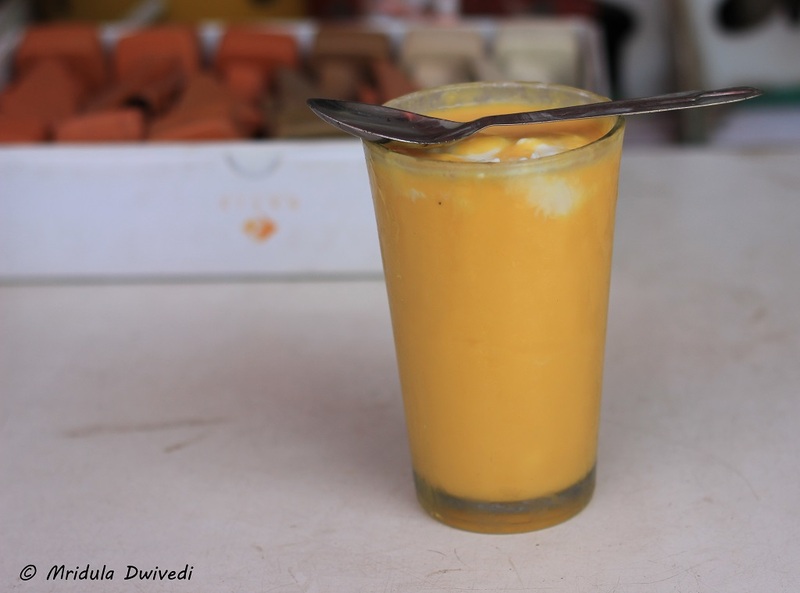 Amritsari Lassi Wala is right across the Odeion Sweets. 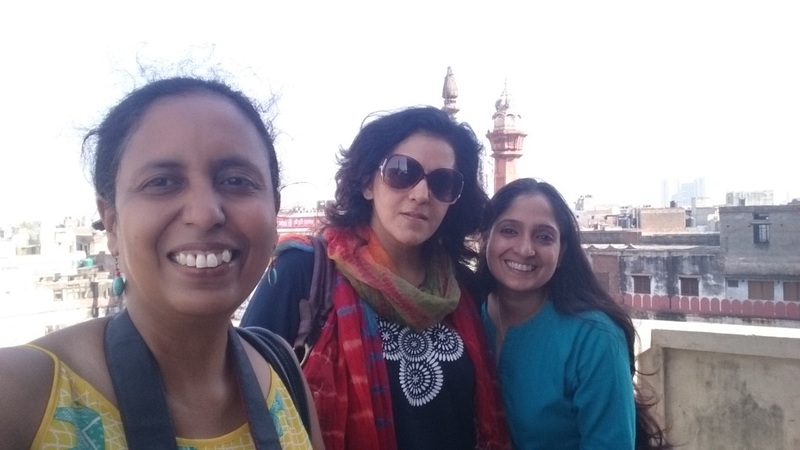 After having such rich foodstuff we decided to walk to the spice market at Khari Baoli. 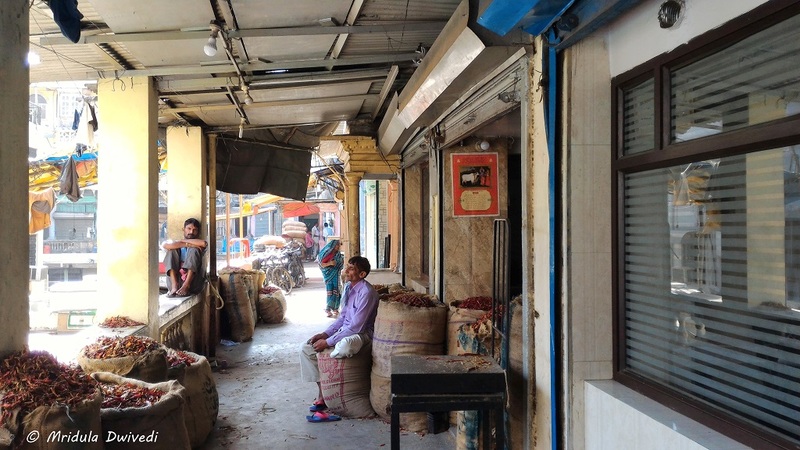 This was my first visit to the spice market and it was a revelation to me. The place has such a unique smell of various spices floating in the air. The smell of dry chili predominates, making everyone sneeze liberally. The colors then catch your attention, yellow of the haldi (turmeric), red of the chilies, green of the cardamom and much more. The streets were full of carts and sacks taking the produce to its destination! 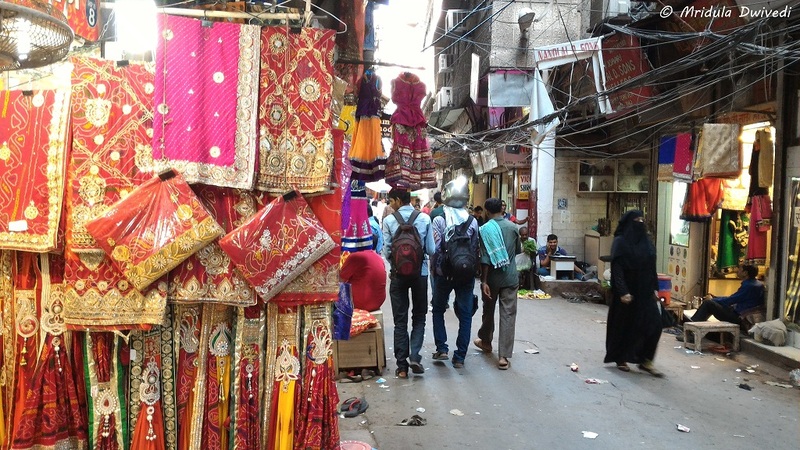 There is Seth Lakshmi Narayan Garodia Market right next to the Fatehpuri Mosque. It is an old crumbling complex with many levels all full of spices. We climbed the stairs into the complex and explored it a bit. It was like entering another era! I do not have much imagination but even I was left wondering about the place and its history. I am sure it would have been a grand place in its heydays! We left the market sneezing and coughing. 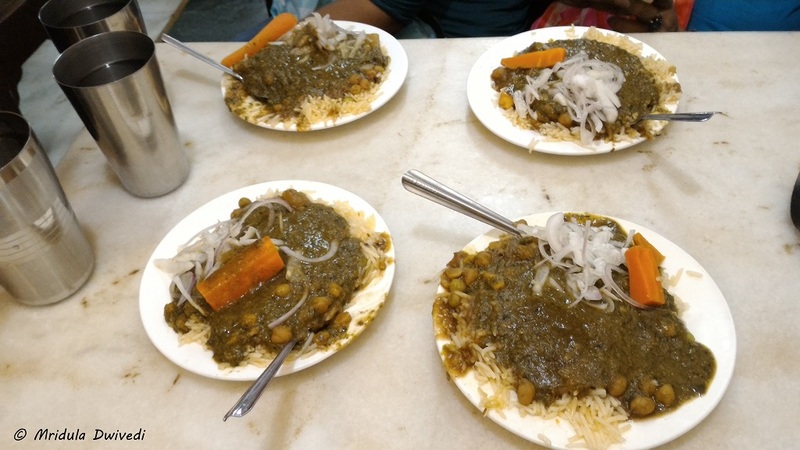 Our next stop was Gole Hatti which is famous for its rice with chole palak. I loved the pickled carrot that came with the main dish. I also enjoyed the imli (tamarind) ki chatani. This time I shared food. There was no way I could eat a plate all by myself. Our next food stop was JB Kachori Wala. They are on FB and Twitter too. Once again we shared food. The kachoris were absolutely khasta (crisp) but once again way too spicy for me. I could eat only a little. 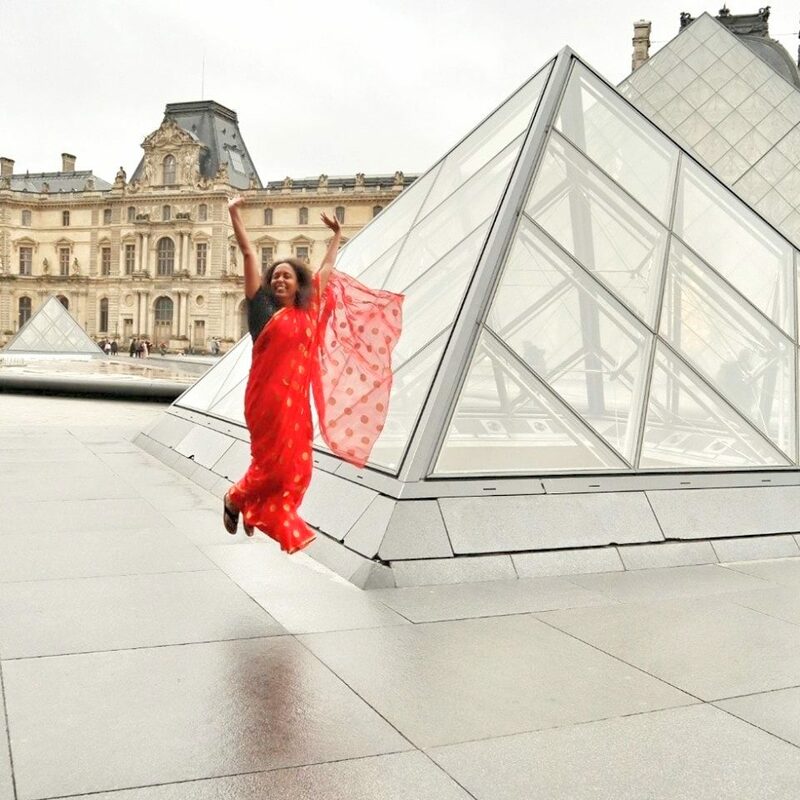 Don’t go by my definition of spicy though, I am known as the European in the family! The gentleman at the shop was extremely courteous and happy to pose for me more than once! Right across it is Kedarnath Premchand Halwai who makes excellent Nagori Halwa. 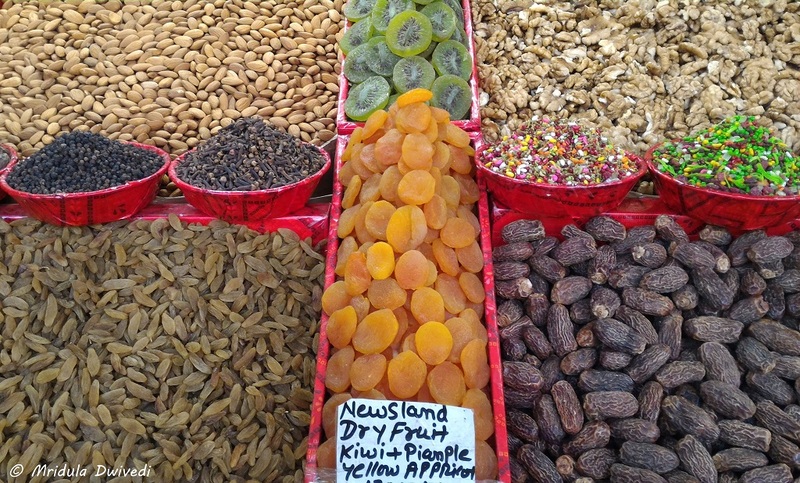 I tried them on my previous visit to Chandni Chowk. Our final stop was the Old Famous Jalebi Wala. Now I have a big sweet tooth and this was my favorite stop! I loved the jalebi with rabri. They were perfectly sweet, not too much and not too little. This shop takes the top spot in my list closely followed by the Amritsari Lassi Wala. I had been on Chandni Chowk Food Walk for about four hours and I was worried about hitting the peak traffic on my way back home. I just barely missed it in the metro. Over all it was a delightful food walk that was organized by Delhipedia.